At Taubenslag Productions, our style and formula for successful children's entertainment is all about being colorful, imaginative, original, and most of all FUN! 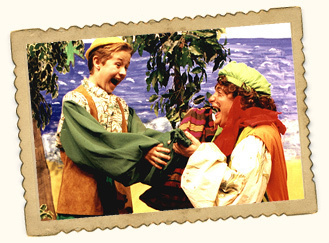 Our productions are best described as fast-paced, Broadway-style musicals for kids. They always involve audience participation, with family members of all ages getting into the action. Our company makes sure that everyone enjoys the hour they spend with us, so they'll be eager to come back and see us again. The New York Times has even hailed us as having “THE BEST KIDS’ SHOWS IN TOWN”. 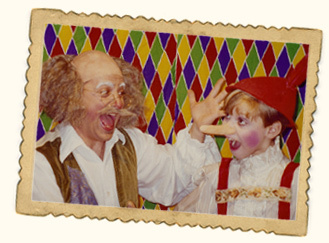 Over one million children have experienced our professional productions. We have a repertoire of over 30 shows to choose from. We also have unique fundraising opportunities for PTAs, PTOs and HSAs to sponsor a show with ticket sales directly benefitting their school. 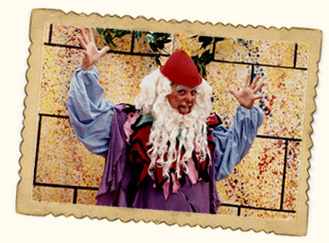 Call us anytime to discuss bringing a Taubenslag Production to your theater and enhance your children’s programming. 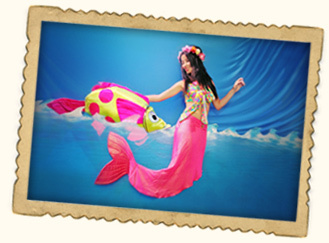 Join the mischievous Little Mermaid for an exciting voyage to the bottom of the sea. Save her from the evil magic of the horrible Sea Witch as she tricks Ariel into drinking the poisonous potion. Help Ariel convince her father that hating someone from another culture is wrong – that they can live in peace and harmony if they all respect their differences. This important musical based on the Hans Christian Anderson fairy tale will make you laugh and cry as the beautiful heroine swims deep into your heart. You better watch out. You better not cry. You better not pout. You wanna know why? The Wicked Wizard's coming to town and he's headed straight towards the North Pole! So grab your mittens, buckle those boots and hop aboard Edie the Elf's sleigh to help save Santa from that nasty villain before it's too late. 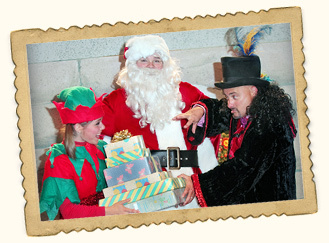 If the Wizard succeeds with his evil plans there will be no more presents to be given out – and no more Santa! This fun-filled action-packed musical comedy from Taubenslag Productions will become your family's favorite holiday treat. Click here to see a video short of Santa Claus Meets the Wicked Wizard. Travel back in time when people believed in sorcery and alchemy. A period when Kings thought they could magically make gold out of hair, trees, sticks – anything. But the more they tried, the more they failed. Soon they realized that no one can make gold – except for one little man – the strange little man who could spin straw into gold. The mysterious little man with no name – or so they thought! 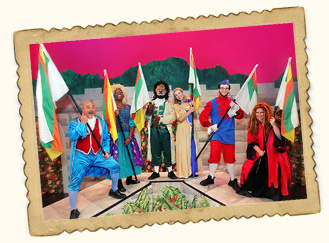 This fantasy-filled musical comedy from Taubenslag Productions is truly a classic all will enjoy! Fly away with Peter and the gang as they soar right into your funny bone. Come laugh as Wendy, Tiger Lilly, and the lost children fight the hilarious Captain Hook and his bunch of silly, rambunctious pirates. 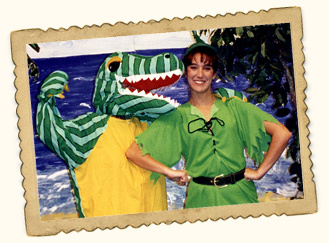 Cheer the kooky Crocodile as he chases Captain Hook throughout Neverland. And most important of all – help save Tinkerbelle by showing her you believe! This musical comedy for the entire family will have the audience rolling in the aisles. Grab your flying carpet and journey to the mystical land of Beggari, an Arabian world filled with thieves, wizards, pirates, sultans and magical genies. 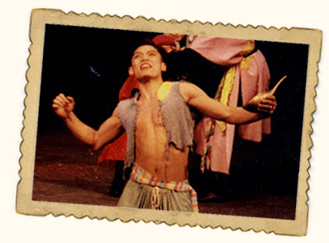 Cheer Aladdin as he explores the depths of the Wondrous Cave where he discovers the fantastic powers of the Golden Lamp. 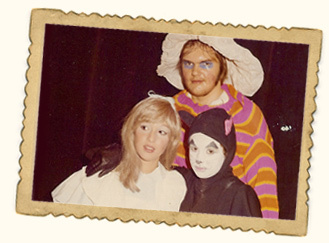 Boo and hiss the Evil Wizard as he captures Aladdin's bride – the beautiful princess. This musical adventure has been dazzling audiences for many years! 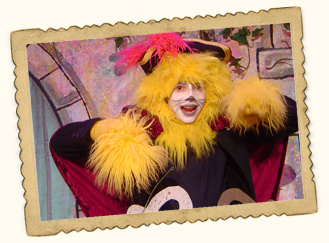 Taubenslag Productions brings to life one of the most beloved fables of all time – the tale of Puss in Boots. This delightful musical comedy will warm your hearts as Puss fools the Kingdom of Plotzenburg into believing he's the famed “Duke of Orez”. Climb to the Peak of Forbidden Mountain and help Puss outwit and conquer the evil Ogre who has been plaguing the kingdom for centuries. Kids of all ages will love this enchanting “tail”. Visit the land of the Leprechauns where Hezekiah, the magical WEE ONE, will save the crying Princess with his bag of tricks. Watch him fool and play pranks on the people who try to steal from him. You'll laugh as Silly Sam marches to the Palace as all the villagers get stuck to his Golden Goose – who knows, you might get stuck yourself. This charming musical comedy from Taubenslag Productions will thrill and fill you with delight. as he soars through the clouds to enter the fantastic world of the humongous Giant. This giant action-packed musical comedy will keep you on the edge of you seats. Taubenslag Productions is proud to present our most outrageous musical comedy for children; the hilarious adventures of Alice in Wonderland. Hurry on down to the theater where Alice and all of her loony friends will sing and dance their way into your hearts. 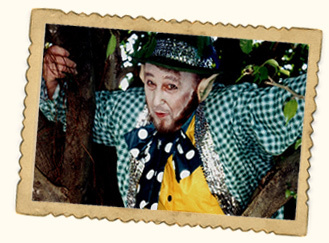 This wonderland adventure is a great treat for children of all ages. Journey to the center of the Enchanted Forest where you'll laugh, cheer and sing along with those adorable fun-loving little men – the Dwarfs. 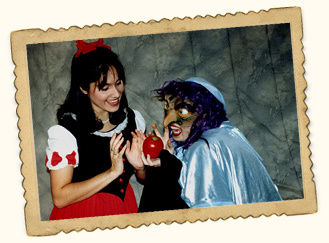 Boo and hiss the evil menacing Queen as she entices Snow White with her poison apple. This enchanting toe-tapping musical comedy will have you smiling for hours after you leave the theater.